This brand new order is for our EasyCabin Ecosmart 12 Air units. The Ecosmart 12 Air provides top quality canteen facilities for up six persons, with a separate toilet, drying room and ample space to rest and eat. The units feature LED lights fitted with passive infrared sensors (PIR sensor) which means the lights can safely remain illuminated all day and hot water available for up four hours each day – without having to make the built-in generator operational. The Ecosmart 12 Air also features an energy efficient diesel heating system known as ‘air’. 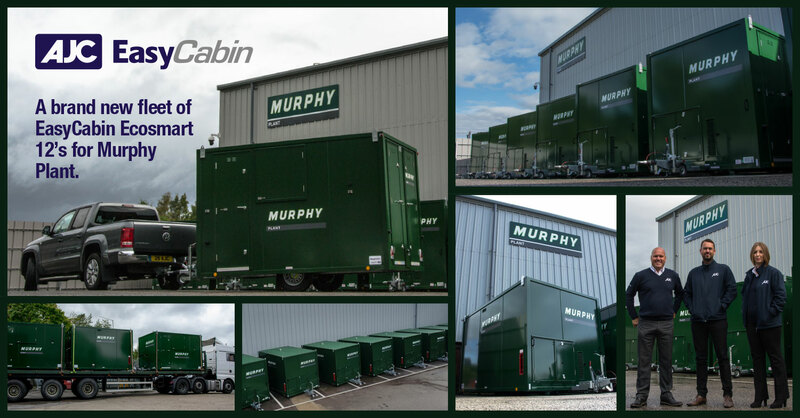 The units have been delivered to Murphy Plant dressed in the iconic Murphy green livery, ready to be sent to sites throughout the country. Murphy Plant is responsible for the day-to-day enablement and operation of plant, equipment and transport for the Murphy Group. The range of supply can be everything from a small electrical drill to a 135 tonne crawler-crane, or even specialist equipment with rail, pipelines, tunnelling, marine, or ground engineering.